What is the Soul Kitchen? The Soul Kitchen has been open for 9 months now, and it seems to fit very well to Saxon culture. I am excited to share my experience and talk about it. As an American living in Germany who speaks very little German, (although I am learning) I tend to watch a lot and talk a little. We are building MotoSoul for riders and we built the Soul Kitchen as an extension of my Dad’s garage/American diner with riders in mind. An interesting thing has happened though – the Soul Kitchen is being embraced by everyone, not just riders. of a strange and unique thing. Importing this idea to Germany was a little risky and we are happy to see that it is working! 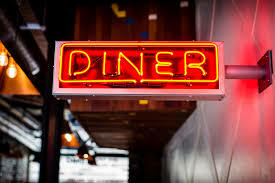 In the movies, diners are shiny red and silver 1950’s Elvis Presley/Marilyn Monroe places in New York City near Times Square or on Route 66 – that is not us! Real American diners are usually on some country back road, in a nearly extinct small town (some will say like Mutzschen!) and they serve local favorites and old family recipes. This is the Soul Kitchen! d we love this tradition. When you walk through the front door of the Soul Kitchen, our open kitchen allows Willi, our amazing Chef to greet you and immediately make you feel at home. The smells from the kitchen entice you and let you know this is going to be GOOD! You can choose to sit with him in the kitchen dining room or walk through to the main guest room, where Benne our Barista and Bartender will make you the drink of your dreams. Whether it is our custom blended coffee roast delivered in an amazing glass or his homemade melonade, it is guaranteed to make you smile. Hannah, our Interior Designer, did an amazing job of blending old and new furnishings that create the perfect atmosphere of comfort and relaxation our guests are enjoying. The lighting is perfect, the candles are lit, and the magazines are ready for you to sit back and enjoy the food. So many cool things are happening at the Soul Kitchen. We already have “regulars” like every good diner in America. They come every week, often order the same thing, and they know everyone by name. On sunny Saturdays and Sundays the courtyard is filled with motorbikes and the outdoor benches are filled to capacity. On rainy days the locals come and fill the inside tables with laughter and family gatherings, often staying for 3-4 hours with a nice walk through the park in between courses. Comfort food is the term used for the food of our childhood, the food that real families eat using the recipes that our Grandma gave us. The menu allows you to have your favorite burger or William may entice you to try one of his weekly creatiions! From 100% beef burger patties made fresh every day to tasty desserts based on American favorites like apple pie and brownies, you are sure to find something on the menu that you will enjoy. So, one last thing you should keep in mind when eating at a diner – come there hungry! Appetizer, entrée and dessert will tempt you, why not order all three – that’s the American Way! We are pleased and humbled that the Soul Kitchen is receiving 5 star reviews from so many customers. We have put our hearts into making this a special place, and our guests can see and feel that. We will keep serving up special food and unique events like our Whiskey Tasting and Coffee Tastings and the locals should keep coming back for more. Thank you to all of our guests. You make it fun to serve you. We look forward to seeing you. This is SO EXCITING! =) You’re creating an amazing community that is enriching many people’s lives. Keep up the good work!